Tonight was a memorable and musical awakening for me and many others who sat listening to the Yuma Jazz Company who brought forth some compelling music of their own creation such as "Intuition" from their new release and some old standards. When you try to summon up in your musical mind just how good these men are at their craft, words seem to escape me, for I was carried along this musical journey by the uniqueness of their play and their character of being. 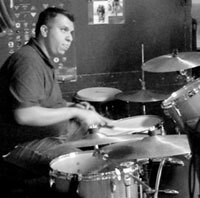 With a guest musician in the mix (Jimmy Caves) the night was more electrifying with the ebb and flow of this musical ride. The vocals handled by Jimmy Caves invoked the image of old in my mind walking the streets of old Kansans City and Chicago listening to the giants of Jazz. Witnessing the character of these men who have mastered their craft with their chosen musical instruments that brought musical joy to us with all its intricacies. Yet at a level for all to hear and digest. These men are good communicators. They inspire because they teach and display their musical skills to those they have taught inspiring them to new heights. 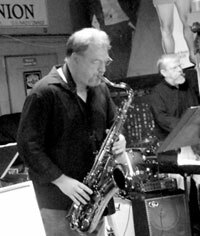 With Brian Carlson on Sax, I could hear the sound of "Wilton Felder" of the Crusaders, and a modern day "Nelson Rangell". 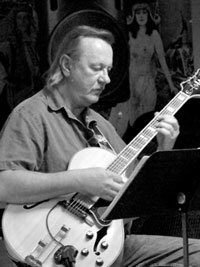 Carl Posch brought memories of George Benson in his early years when he (George) spoke of intently listening to Wes Montgomery & Charley Christianson. Brandon Coz play those drums like no other. 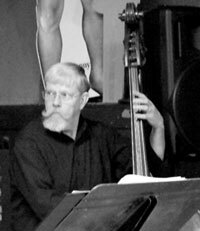 Jon Knudson riding the wave and pushing that big bass fiddle along the baseline. 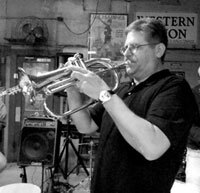 Steve Hennig, with his trumpet likened to the old days of "Maynard Ferguson" blowing that trumpet with fire. It is no secret that these men are musically very sound, and even more so as a group when they combine their talents. Tonight the Yuma Jazz Company moved me beyond what was previously known to a new reality in two words, just "damn good". Be forewarned Yuma, the Yuma Jazz Company is the best combo group in town. Long live the music of Jazz and the men and women who nourish and communicate this music to their children, our children and all children.